After many, many years of running indoors sports for the Armidale community we have decided to have a break. In its place we have something new and exciting for Armidale. 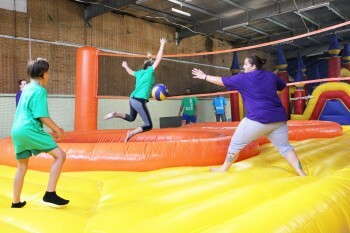 Volley bounce runs on normal volleyball rules, i.e, no hitting with any other part of body except arms and hands, with a max three hit return. Bball you can use any part of your body to hit the ball (mostly feet, backflips are encouraged) and have a max 5 hit ball return. We have comps running Monday to Wednesday. Contact us if you would like to get involved. 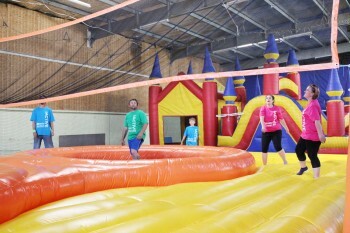 Thursday to Saturday the courts are available for hire for friends, family, business team building. $80/hr, so $8 each (2 teams of 5). If you would like one of our staff to referee and guide proceedings add $100.